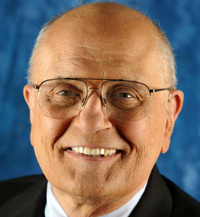 John Dingell was interviewed for the Gerald R. Ford Oral History Project on July 23, 2010 by Richard Norton Smith. Smith: First of all, thank you very much for doing this. This is clearly a very different institution from the one that you came to in 1955. For people who can’t imagine what it was like then, when you were a freshman – your Dad had been in before you – and Gerald Ford was probably here for his fourth or fifth term – can you give us an overview of what this place was like in the mid-‘50s and how it differed from the modern Congress? Dingell: If you’ve got a lot of time, I can do that. The problem there is that the differences are very large, but they’re very subtle. And they’re related not only to substantive differences and political differences, but they’re related very frankly to something else, and that was the times and the forces and the sociological events that drove this place as they drive it in every Congress. We were a post-war Congress at that time and the concerns that people had were how we were going to get over the war. We were not yet out of it. We were just beginning to get our peace time economy going because we converted the entire economy to a war footing. Having said that, this was kind of one of the cusps that we passed in history where the Congress goes through a significant change. Congress was undergoing a significant change because of the situation of the world; the United States had become a world leader. We were important, but not necessarily a leading force in the world before the war. That change was going on. So, the Congress at that particular time would come in in January and would adjourn sometime very close to the first of July or there about. We hadn’t yet evolved the national budget in the sense that we have it today, although we did have one. And the Congress didn’t have a conventional budget. That was set up in sort of a hit or miss fashion by any administration that happened to be running the place. And the Congress was a more reactive body. You have heard, I’m sure, almost everyone who talks about that time will tell you that that Congress was essentially a body that didn’t involve itself in all the issues that it does now. It wasn’t that kind of partisan entity that it is today. And, of course, we didn’t have television either in the nation or on the floor, although television was beginning to come in. Smith: Was it more of a village? Dingell: Well, Washington before the war was called “the little town in the woods,” and before the war – actually until the late 30s – the Congress would essentially leave town as soon as it got hot. They air-conditioned the place, so the Congress which had previously been here from about the 20th of March until the about the first of June, and then would come back for a special session in October if that was necessary, no longer did that. And the result was that the Congress had moved to essentially a six month session, although it came to the point where the Congress would meet for longer and longer periods. During the war, they would start on the first of January or the third of January, whatever the date might happen to be, and they would adjourn the Congress on the last day of December. And they often set the clock back so they made sure that the Congress wasn’t intruding into the affairs of the following Congress. And the body was smaller. We had two less states than we have now, although the size of the body was the same. Districts were much smaller. Smith: Staffs were much smaller. Dingell: Staff was much smaller. I had a staff of four. I had one roundtrip ticket home to Michigan, so I had to be pretty careful about how I traveled. I had no long distance telephone account. I had four typewriters. If I got more, I had to buy them myself out of my own pocket. And a member of Congress wasn’t particularly well paid in those days. And we had relatively small committees. The Commerce Committee was 29 at that time. Today, it’s much larger than that. We’ve got subcommittees of 29 members. Smith: Presumably you do much more oversight today than you did then. Dingell: Well, we do and we don’t. I learned oversight from my dear friend John Moss and a fellow by the name of Bob Lischman and others who understood how oversight was done. I’m not sure before that people really understood oversight, although there are people like Kefauver. And, of course, there was the great oversight that was done on the Depression to find out what were the causes of that. And then, of course, there were the perversions that you saw in McCarthy and the way he conducted his business. The oversight really sort of hit its flower in terms of high quality good work, when Harris became the chairman of our committee and a fellow by the name of Sam Rayburn decided he was going to have oversight to find out how the Eisenhower administration was subverting and suborning the regulatory process which he was the fundamental author of, if you remember. But Congress has always had oversight. We haven’t necessarily done it well, but at this particular time we’re doing it sort of well. But oversight is something that you do with real focus on whether the law is being properly implemented, people are being properly served, and public monies are being properly spent. And it’s not really something that should be political and, unhappily, under both parties of late, it’s become quite political and it is opposed to something that’s more bottom-dwelling on seeing to it that the Congress is an ancient function. And this goes back to about 1699 when there was a British parliamentary committee that caused a collapse of the government over peace negotiations between Britain and France, which essentially sold out Britain’s Dutch allies. Smith: We’ve heard from a number of people that one of the really significant differences between then and now is that members then tended to bring their families with them to Washington. Dingell: That’s true, we did. And I’d bring them down and my dad did the same thing. In January, we’d load the whole tribe into the car and we’d usually rent a trailer. Come on down here and we’d stay here until the Congress would adjourn and would try to guess when that would be. It’d usually be around the first of August or something like that and then we’d go home. Smith: And the suggestion is that the wives played a significant role in fostering relationships, social relationships across the aisle. That there was much more social interaction with people than is the case today. Dingell: That’s true. And that was a very important thing. And it was particularly important because the wives lent a civilizing and valuable impact on the way the Congress worked. They moderated the more extreme behavior of the members and saw to it that friendships existed across the aisles. Kids on both sides of the aisle would date each other and we’d have marriages where people would get married across the aisle, kids of members on different sides. And it tended to make for a warmer, friendlier place. Members did things together and they would travel together and, of course, then you’d travel on boats and things like that as opposed to traveling on jet aircraft where you’re programmed for every second and you really don’t get to know anybody. It’s just sort of a rat race. Smith: There are stories from the ‘60s when Gerald Ford was Minority Leader and Hale Boggs was his Democratic counterpart. They would debate at the National Press Club and they would drive down together and decide on the way what they were going to debate that day. They would have their debate. And then they’d adjourn and have a drink and their lunch. It was a very civil, very friendly sort of relationship. Dingell: Well, a few things about it. One, it was a different time. Two, they were different kinds of people. And, three, the pressures were a lot different on them. But that was more of a common thing that occurred here where members did become friends. They played golf together and at the House gym which was a wonderful institution, still is, but we had a game we called paddle ball. That was a rough, rough game and it lead to tremendous friendships over the years. Sam Rayburn took the gym crowd on one day and they just beat the socks off of him. And Sam said he’s never going to take that crowd on again. And Sam was a potent, powerful leader, if you will recall. And there were other things that went on. Smith: Do you think there’s misplaced nostalgia for that period? I mean, are there things about that period that you are just as glad to see gone? Are there things that are clearly better about Congress today? Dingell: Well, I have nostalgia for those days sometimes. That was part of my formative years, so I probably see it differently than the newer members. Most newer members don’t understand what happened or why or how the parties worked, and so there’s a sense of loss of the old way. There were faults in the way the Congress functioned then and there are faults now. And so the changes that benefit on some level, created this new array of faults to replace the previously existing set of faults. And, of course, it’s all in the eye of the beholder anyway. Smith: Okay. How did your paths cross and what was his reputation at that point? Dingell: Well, I’d known Jerry when he was a young member. I worked from time to time on the Hill in different small jobs and so I kind of got to know him that way. And I got to know him through Dad. Jerry was very much focused on his district and on internal Republican politics. So, I got to know him, not real well, but we became close friends in the state societies. Those were quite important. And people belonged to the state societies and, of course, Jerry and I did and our wives did. And his wife and my first wife were kind of movers and shakers in the town and used to work to make things happen. So, we would get to know each other that way. Got to know our kids. And Jerry was a very good friend. I remember one time, Betty had a baby rather late in their marriage and I remember we were feeling pretty good that night, so I spent the evening congratulating and telling him how great it was. And Jerry got this kind of sour look on his face because I think he thought that he was going to finally have a little bit of freedom to enjoy his wife and his business. And then, of course, the same thing happened to me at a later time, so I felt the __(? )____ was sort of settling up my misdoings. Smith: Did you like Betty? Dingell: She’s a fine woman. And we still have a small correspondence between us. And she is not only a pleasant and nice person outward, but she’s a very decent, fine human being, which is much more important. Smith: How tough was it for political wives? Dingell: It’s always hard. The family always takes the beating for the members. If you look, you’ll see the tremendous number of divorces that exist here, the numbers of kids that get in trouble, and the family troubles that members have because of the pressures of the job. And I’ve seen it from both sides. I am the son of a congressman and I’ve raised kids and so I’ve seen both sides. I’ve seen the adverse impact on the family for the kids and I’ve seen the pressures that create that situation. It’s a very substantial thing. It’s no better or worse than it was at a different time from an earlier time, it just is a little different. And I can tell you that at one point, we had about 19 members in the Michigan delegation, but we had almost a majority of the members from Michigan that had divorces going on. And it wasn’t because they were playing around or anything, it was just the abnormal pressures that center on the family and makes it very, very hard for husbands and wives to maintain a sort of normal family life in this particular job. Smith: Let me ask you. In the early ‘60s, there comes the Goldwater disaster for Republicans. Smith: In ’64, yeah. And Ford takes on Charlie Halleck. Now, earlier, of course, Charlie Halleck had taken on Joe Martin, so you had a little bit of a turnaround. Dingell: That happens fairly regularly over there. If you remember, Halleck took on Martin, Ford took on Halleck, and then nobody took on Jerry. But, if you will recall, the successors in that had troubles and, as I remember it, there was a terrible attack on Michael by Gingrich. And then Gingrich had his own troubles, as you will remember. And the Republicans do this much more than do the Democrats. And I won’t comment on that because I don’t know whether it’s personal ambitions or whether it’s traditions of the party to try to get rid of what they view as being ineffective leaders. Dingell: Well, he had losses. The Republicans didn’t take the Congress twice. Joe was an old-fashioned guy. A very nice guy, very much liked by everybody on both sides of the aisle. He had a terrible problem with the English language. We used to call him Mr. Malaprop after the character in the book. And, you’ll remember, he would always misspeak in pretty awful ways. One time, Charlie Halleck was bringing the Prime Minister of Indonesia in to address the Congress when Joe Martin was the Speaker. And Martin recognized the two of them, he says, “The Chair recognizes now the distinguished gentleman from Indonesia and the Prime Minister of Indiana.” And those were just mistakes that you can’t make too many of. Smith: Then comes Watergate and Agnew’s resignation. And the story is that Gerald Ford became vice president in large measure because Democrats in Congress lead by Carl Albert and Mike Mansfield made it clear to President Nixon that Ford was the only candidate who would be easily confirmed. Dingell: Well, that didn’t come as a great surprise to anybody. That was quite frankly common thought around. As a matter of fact, it was a consensus that there would be nobody else, because, if you’ll remember, times were very poisonous then. And Nixon had alienated everybody. The Republicans were angry with him because they had to defend him under intolerable circumstances. Smith: Were they angry at the White House? Dingell: Yeah, because they put on them an intolerable burden. There’s an old saying by Napoleon. At one time, his Minister of the Interior and the Foreign Minister quarreled about whether they’d accept this particular thing that Napoleon said was a crime and both of them claimed credit for having given this particular response, but they said, “It was worse than a crime, sire. It was a blunder.” And that was what Nixon had done in a rather appalling way apart from the criminal aspects of it. Of course, Ford then got himself in huge trouble over the pardon, which very truthfully seems now in the cold light of history the right judgment. Smith: What was your reaction at the time? Dingell: I was outraged. But then I knew Nixon, I knew him back to the first race he’d run and he was one of the dirtiest fighters in American political history. Although, in the cold light of history, he looks like a lot better president than some that have served since he was there. Smith: And then Ford, of course, came up and did something no president has done before or since, he came up and testified here on the Hill about the pardon. Dingell: He didn’t have much choice. Ford entered into the presidency of a country very much divided and angry. And Ford, to his vast credit, came up with a series of steps which abated a huge amount of the overwhelming hatred and anger that was burning in the country at that particular time. Smith: Did that include the first step toward amnesty for Vietnam draft dodgers? Dingell: That was one of many. Remember, the country was divided over Vietnam. We still had some of the lingering results of McCarthy and there was, of course, all that Nixon had done with wire taps and enemies lists and using the IRS to spy on Americans and Watergate itself and the lies and the things that he had done and said about Democrats over the years. So, Ford had to abate all this and that’s one of the reasons he pardoned Nixon is because he just didn’t want to have to run around the country explaining why Nixon was being tried or not tried and thought he’d get rid of that with one swipe of the presidential pen. Smith: One way of looking at the Ford presidential trajectory is he spent two and a half years, not necessarily unlearning what he knew as a congressman, but learning how to be an executive, which one senses is a different set of skills. Dingell: Well, he didn’t unlearn anything and what you learn up here is always useful, wherever the hell you happen to be. But, having said that, he did have to learn a whole new set of skills and Jerry, you’ll remember had never had any real executive experience. But there are some things about Jerry Ford that need to be said. First of all, one, he was a very decent man. Two, he understood government and he wanted it to work. Three, he understood people. Four, he had friendships that he could call on to help him to govern even across the aisle. As a matter of fact, he probably had as many friends on this side of the aisle as he did on the Republican side, and probably a few less enemies. He also understood that he couldn’t govern if he carried with him all the burdens that had been created before him by McCarthy and Nixon and the others. And, so he went on to abate that – in that he was tremendously successful. And I will tell you this, Jerry had he had just a little more time to campaign, he probably would’ve been elected, not reelected. Because you remember he was the only unelected vice president and the only unelected President. But he frankly ran out of time. There was a very interesting thing, he not only had trouble with the Democrats, but we worked with him. I’d go down to the White House and work with him. I was chairman on the Energy Subcommittee and handled most of the energy policy. The people down there, and I won’t tell you their names, but would constantly come by and talk to Frank Zarb, who is my beloved friend, and tell us about the latest things that the right wing had done to Ford in terms of the battle for the nomination for the presidency. And, very frankly, there’s good reason to think that they in fact sandbagged Jerry Ford to get rid of him and have a clear shot at the nomination next time. Smith: One quick thing, because after ’74, you’ve got the Watergate Babies who come in the House. Clearly that’s a turning point in the history of the institution. A lot of the energy debate was over the decontrol of natural gas. Dingell: But there (?) also was over control of a lot of things. And you must remember that that came about in good part because Henry Royce and I and a number of others pushed through legislation allowing the President to impose price controls if the economy began to overheat and inflation became a problem. If you remember, they had the WIN buttons and all the Whip Inflation Now. And so, there was that which was going on and Nixon used the authorities which we gave him over energy and the authorities we gave him over price controls, put them together and created the Federal Energy Administration which he had headed by my dear friend Frank Zarb. Smith: At one point, the story goes that Ford had a handshake deal with the Democratic congressional leadership, including the Speaker and Senator Mansfield, on a schedule of decontrol. And they came back a week later and said, “We can’t sell it to our members.” Does that ring a bell at all? Dingell: No, it doesn’t. But I would tell you that Albert strongly favored decontrol. I think Mansfield did, too, although Mansfield didn’t talk that much about those things. Albert didn’t either, but you could read Albert a little more easily. Smith: Jerry Ford said to people the thing that frustrated him so much about ’76 – in some ways it goes back to what you just said – is he felt he had just mastered the job when he lost it. Dingell: He may have. You never master that damned job. It’s the most hideously cruel complicated difficult task in the whole political lexicon. Dingell: I think up in Ann Arbor one time when he was up there for a speech at the Jerry Ford School. Dingell: I never saw Jerry get angry. He may have, but I never saw it. We all get angry, but we show it in different ways. He never showed it to me. Dingell: Sort of. He wasn’t a real funny guy and he didn’t have a great sense of humor. I want to make it clear I happen to like Jerry Ford a great deal, then and now. Now, of course, he’s dead, but there are good memories of him and no great criticisms of him. Smith: Final thing. How do you think he should be remembered? Dingell: Very well. Decent man. Strong President. He was able to work with the Democrats and the Republicans. He could work more effectively with Democrats because we had a different and more wholesome attitude about that than did his own people. He had some who’d work with him very well, but he always had those crazy far right friends that curse the Republicans so terribly. And they would always go out to knife him in the most underhanded ways, because winning was more important to them than the public interest. That remains the case today. Smith: Last thing. Last because it is important. When Saigon fell at the end of the Vietnam War in the spring of 1975, I’m sure there was a desire on the part of a lot of people to put it the rear view mirror, to consign it to the history books. And the President got very angry because money that had been appropriated for the resettlement of refugees was at least temporarily taken off the table. And he put together this crazy coalition and got Congress to restore money and they brought out about 120,000 Vietnamese refugees. Dingell: I don’t remember how and I never did any study of that particular interest, so I can’t give you an intelligent comment. Smith: The War Powers Act? Dingell: War Powers Act did not do that. War Powers Act was passed to curb Nixon’s excesses and see to it that that was part of a long term fight between the President and the Congress, the Republicans and Democrats on either side. And the idea was to see to it that the President was responsive to the wishes of Congress and it’s a battle that goes on now. You saw it over Korea, you saw it over events prior to World War II, you’ve seen it over Vietnam, and, to a limited degree at least, you’ve seen it over Afghanistan and Iraq. Smith: Would you like to see restored the constitutional requirement that Congress declare war before we fight one? Dingell: It’s still there. The trouble is, you have a built-in conflict in the Constitution itself. President is Commander-in-Chief. The Congress has the power of the purse. The Congress has the power to declare war. The president can commit troops and don’t think that the president, this president or any president, has not committed troops around the world in different places. And this goes back – I think if you and I were to sit down – you’d find that Washington didn’t, but I think you would find that Jefferson did and I think you would find that there were all kinds of commitments of American troops in different places as to carry out the American policy without the approval of Congress. Sometimes there’s discretion with Congress, sometimes there’s not. Truman committed us to Korea and a lot of other presidents have done this. We were constantly in Mexico. Wilson did it, if you’ll remember. I don’t think Teddy Roosevelt did, but that wasn’t because he wouldn’t have done it, it just was because he never had time or a chance. So, it was a regular practice in global diplomacy in Mexico and South America – a regular practice of the American administration. If you look at the westward expansion of the United States it was largely accomplished by the president using arms, particularly against Mexico. But we came close to having a war over the Canadian border, particularly 54-40 and the Washington-Oregon territory. Smith: Perfect. Thank you very much. Very much.